The little bikes are taking over. More and more manufacturers are adding small dual-sport bikes to their ranks. And riders are enjoying smaller scramblers that aren’t intimidating, don’t break the bank, and won’t cause tears when they fall over. Kawasaki has cottoned on, and have two new baby dirt bikes on their books: the adventure focused Versys-X 300, and the more stripped back KLX250. The KLX has actually been around since 2009, but took a hiatus in 2014 before returning mostly unchanged—except for a switch from a carb to fuel injection. This little number is a carb’d 2012-model KLX250. 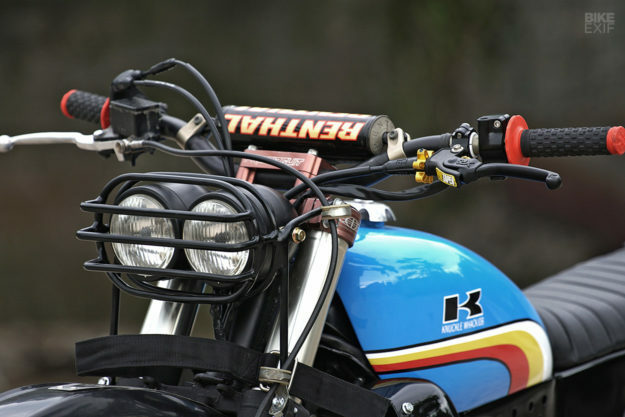 It’s been given a serious hit of vintage enduro steeze—and a few choice upgrades—by the crew over at Knuckle WhackJob. 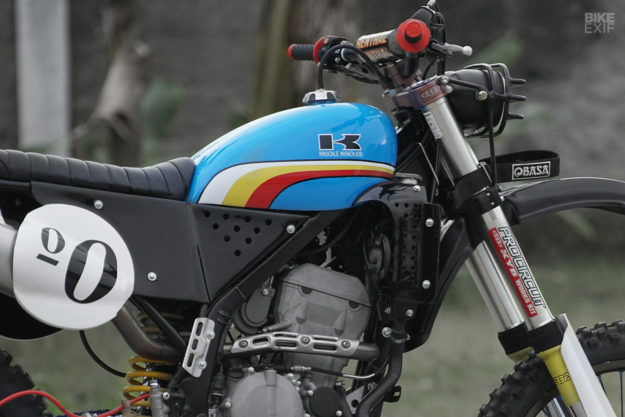 Based in the Lebak Bulus province of Jakarta, Knuckle WhackJob not only have the best name in the business, hands down, but they have a knack for building really fun bikes too. We discovered them last year, courtesy of our friends over at Gas Tank Magazine, and have had our eye on them since. 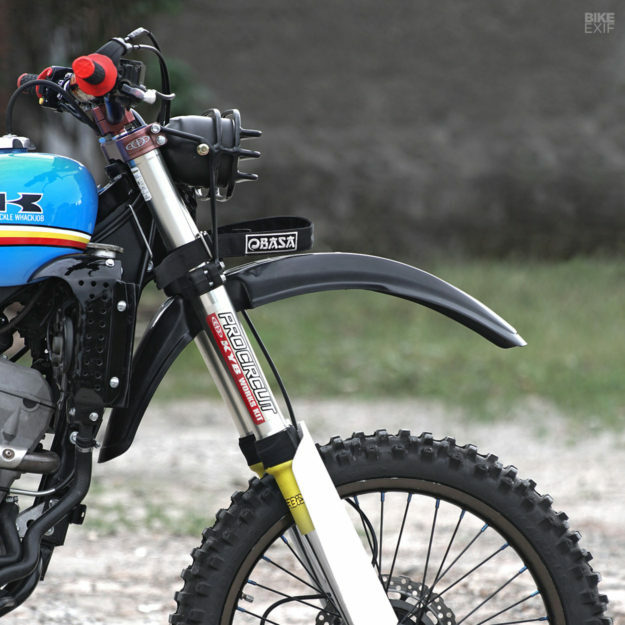 This KLX250 was never really meant to be a custom job, but KWJ’s head wrench, Otir, has a huge imagination and zero restraint. 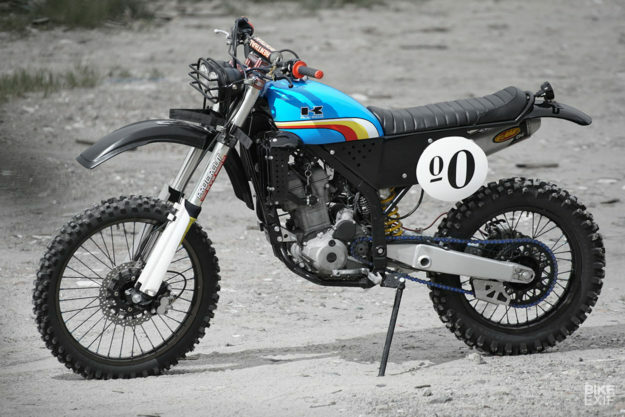 The owner just wanted a Yamaha YZ250 swing arm and shock grafted on—and maybe some light subframe mods—but Otir convinced him to go all the way. After the KLX was modded to accept the YZ250 parts, Otir installed a YZ front end too—giving the suspension department a serious boost. The guys fitted the forks by way of a Pro Circuit kit, with a new top triple and bar risers. The wheels are the original 21F/18R combo, but they’re now wrapped in grippy Maxxis rubber. The guys wanted to leave the engine mostly stock, so they treated it to a polish and port job, then had it sand blasted and powder coat. 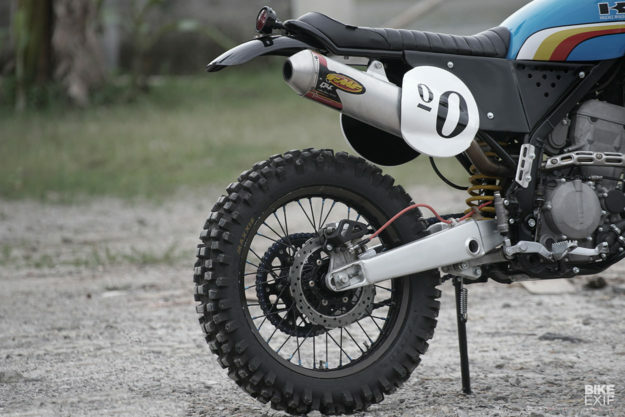 An FMF Power Core 4 muffler adds a little extra grunt. As for the Kawasaki’s bodywork, none of it survived the cull. 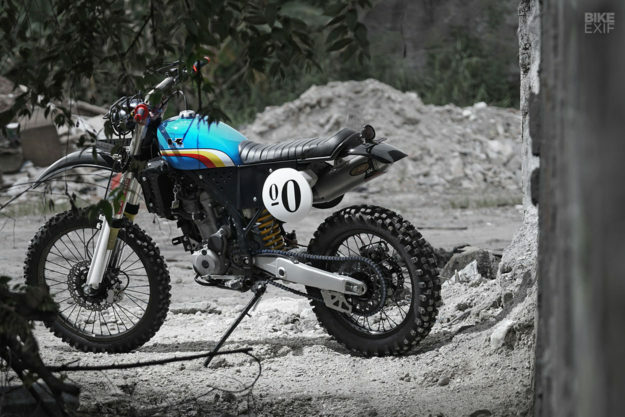 The tank looks like it’s off an old enduro bike, but that’s just because the new livery is so on point. It’s actually a one-off, hand-shaped for this project in Knuckle WhackJob’s own shop. You’ll find their handiwork lower down too. The radiator shrouds are custom made, as are the side covers with their integrated number boards. Look closer, and you’ll spot that the right side board’s been shaped around the exhaust, doubling up as a heat shield. There’s a new seat up top too, designed to be long enough for the rider to move around on. 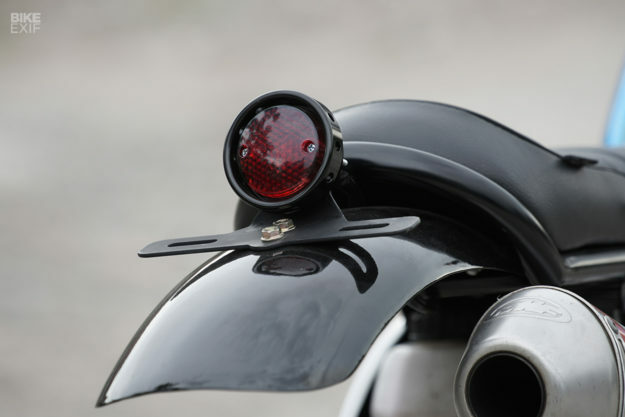 The guys redesigned the subframe underneath it, giving it a classic kick in the end—and capping it off with a new fender and a classic-style LED taillight. Even though Knuckle WhackJob have loaded the little Kwakka with tons of old-school touches, they’ve also added a bunch of modern, practical mods. In the cockpit you’ll find Renthal bars, ProTaper grips and controls, and Domino switches. The forks wear a set of plastic guards, and plus Acerbis seal protectors. There’s a sump guard lower down, and a full-length front fender to keep muck out of the rider’s eyes. Lighting comes from a pair of vintage lights housed in a hand-made cage. And there’s even a recovery strap just beneath—handy for dragging the KLX out of sticky predicaments. We’re especially digging the 70s-inspired livery; a vivid blue punctuated with red, yellow and white stripes. And the ‘Knuckle WhackJob’ decal under the period correct Kawasaki ‘K’ is just killer. The rest of the parts have been subtly finished in black, with a few crafty highlights—like the blue chain and red rear brake line. But what we like most is how well Knuckle WhackJob have meshed old and new on the KLX, while giving it a proper worn-in vibe. 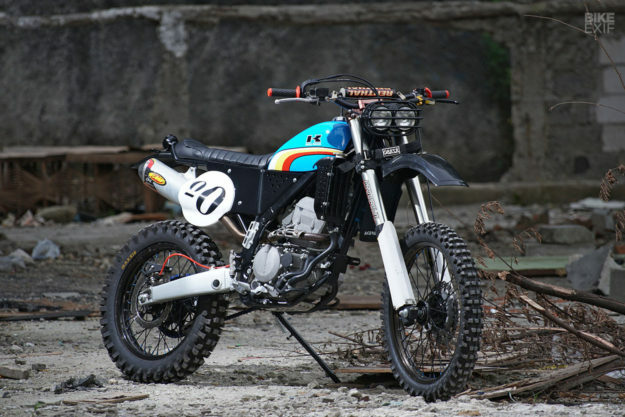 We’d have no qualms getting this scrambler dirty.